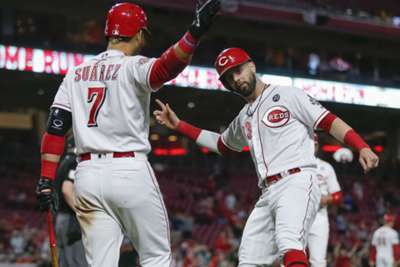 It's not often a two-win team is one of the highlights of Major League Baseball action but, on Tuesday, the Cincinnati Reds pulled off an impressive victory using a seven-run sixth inning to top the Miami Marlins, 14-0. It wasn't just Cincinnati's offense that was hot. Reds starting pitcher Luis Castillo continued his success on the mound. Through his first three starts, Castillo has an ERA of 0.92 with 25 strikeouts. Opposing hitters are just 5-for-61 (.082) against the righty. Jose Urena was given the loss after allowing eight runs, four errors and striking out four in five innings. Lewis Brinson went two for for the Marlins. The Philadelphia Phillies' Bryce Harper smoked a three-run homer off of Stephen Strasburg in the third inning. But, the Washington Nationals ended up winning 10-6 in extras. Bryce Harper does it again against his former team. Jay Bruce hit his American League leading seventh home run in the Seattle Mariners 6-3 win over Kansas City Royals. With the New York Mets 14-8 loss to the Minnesota Twins, deGrom's quality start streak ended at 26. He had tied Bob Gibson for the longest such streak in MLB history. Remember the aforementioned Nationals win? It was thanks to Juan Soto. This three-run home run put Washington up for good. New York Yankees (5-6) at Houston Astros (7-5), 7:40 p.m. ET — New York will try to avoid being swept for the first time this season. Houston has won the last two games, narrowly getting by in the first match and then picking up a 6-3 victory on Tuesday. The Yankees will start James Paxton while the Astros will send Collin McHugh on the mound. 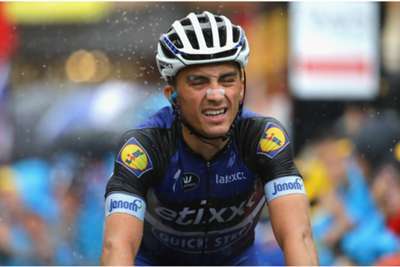 Less than a bike length separated Julian Alaphilippe from second place as he won La Fleche Wallonne for a second year running.